To most people, ancient Roman homes bring to mind the beautiful Roman villas seen in Roman peplum movies, with a courtyard or an atrium and beautifully decorated rooms. These villas were called domus and only the very rich could afford to live in them. Most Roman citizens lived in small apartments called insulae. These were often cramped and smelly as many people would live in them. If you imagine Rome 2,000 years ago, you have to imagine a city with impressive marble buildings like the Coliseum or the large temples in the Forum. But Rome then was not a clean, marble city. Near these impressive buildings, you would find these smelly, overcrowded insulae. Rome then looked more like the city of Kolkata than the city of Paris. The city of Rome was buzzing. The insulae had shops that would face the street, bakeries, taverns, workshops, etc. There was a lot of traffic on the street, horse or donkey carriages, people rich and poor walking, etc. The workers or the owners would live above and behind these shops. The insulae could be very high, even 6 or 7 stories high, which was high for that time. They were built with wood and brick, sometimes they would even collapse or catch fire as they were often badly built. The most expensive apartments were situated in the lower floors while the apartments in the upper floors were usually smaller, more crowded and cheaper to rent. The lower floor apartments often had running water, lavatories and heating while people living in the upper floors had to use public restrooms. It was forbidden to throw excrements on the streets and people had to use the latrinae (public restroom), even though the law was often not respected leading to the streets becoming horribly smelly. The insulae were often owned by the upper class (the equites) who would charge rent to the lower and middle classes living in them (the plebs). The Roman upper class had a different lifestyle, the lifestyle that you see in ancient Rome movies. Rich Romans in the city or the countryside would live in a domus. The domus was a large house with an atrium or a courtyard in the middle. The atrium was the reception area. It had an impluvium in the middle which was a little pool that would carry the water from the compluvium placed on the roof (the compluvium collected rainwater). The impluvium had a cooling effect in the atrium and the entire house. The atrium would serve as a reception area or a living area (like a living room today). Aristocrats would receive their guests, do business in the atrium. 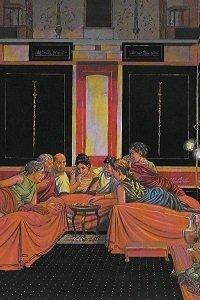 The domus also had a kitchen, a bathroom, cubuculi (bedrooms) and a triclinium which was a dining room where people would eat lying down on couches. Very wealthy Romans had extremely luxurious houses with marble floors, many dining rooms, a private library where they could read, a private bath meaning a bathroom with a sauna and a pool. 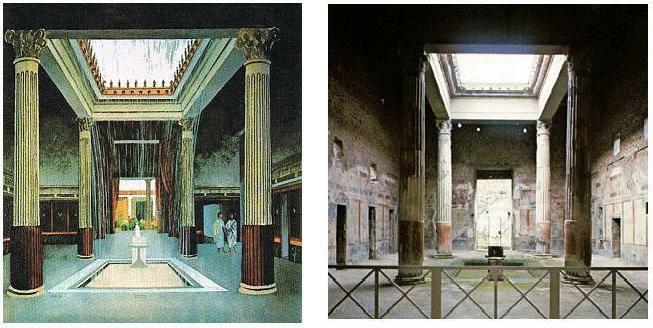 Obviously these ancient Roman homes were very clean and had servants. They would even have a similar home in the countryside in addition to their domus in the city. It is worth noting that the insulae and the domus were in the same neighborhoods. There were no neighborhoods containing only rich houses similar to rich suburban neighborhoods today. Very wealthy Romans would also have their domus in the countryside to get away from the dirtiness of the city. 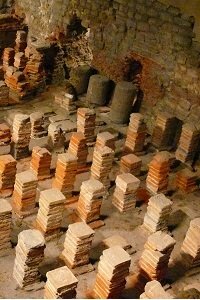 At around the end of the 3rd century, there were about 1,800 domus and roughly 45,000 insulae in Rome for a city with a population of about 800,000.